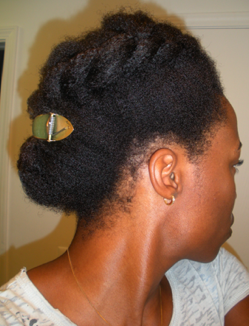 So a few "Hair Diary" entries ago, I talked about adjusting my regimen so that I can reach hip-length by late 2014. In this same entry, I also discussed an experiment with a new detangling method. (Here is that entry for those who missed it.) So what is the update on that? So far, so good. Other than tweaking my detangling method, I also need to incorporate protein deep conditioning to help with length retention. Why? The ends of my hair are the oldest and thus most worn and susceptible to breakage. During my first five years as a natural, I rarely (probably less than a handful of times) used protein conditioners, but that might have to change if I want to reach hip-length. 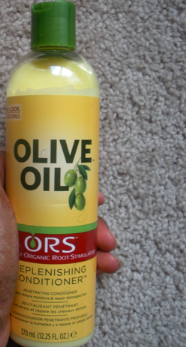 So that being said, I have been using ORS Replenishing Conditioner after the past few washes. (This is separate from my detangling conditioner - Suave/Tresemme.) I will report back with an update on that in the near future. Pre-shampoo treatment on the go. 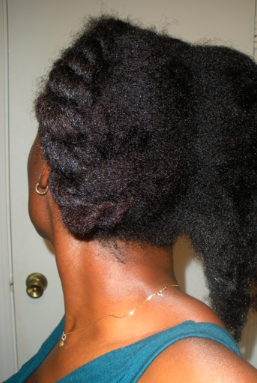 Coconut-oil drenched hair in jumbo flat twists. Mandatory shrinkage comparison. (LEFT) Mostly shrunken wet hair. My hair shrinks more than this once dry. (RIGHT) Stretching that same section of hair. All done twisting. I do not usually twist on wet hair, but I was on the go. Planning to keep this in for 3-4 weeks. 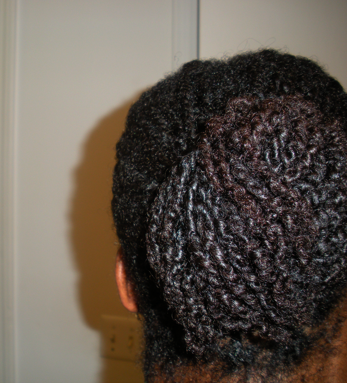 Attempted back shot of the twist bun. A new staple in my regimen. Good luck on your hip length journey! I am motivated by how much your hair is thriving. Didn't think us 4abcdez girls could grow our hair out past shoulder length. Do you have an instagram account? I would love to see more pics of your hair. 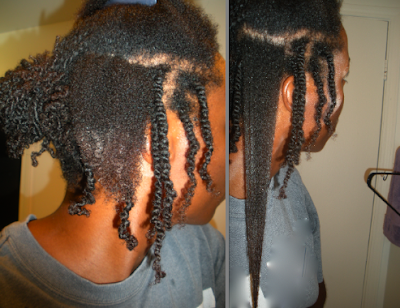 Your twists are so beautiful! Two-strand twists are my absolute favorite hairstyle. I always do mine on wet hair. I bought the ORS Replenishing Conditioner to use as a protein treatment months ago. Because I have low porosity hair, I rarely need a protein treatment so I haven't been able to use it yet. I can't wait to try it! This post is right on time. I'm also incorporating protein into my routine. I've never used protein as a dread and it's finally starting to show. Your hair looks fab and I can't wait to follow your process. 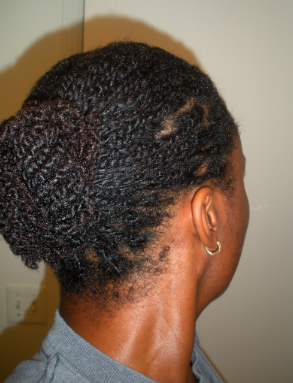 I love the twists too! I love hearing about hair growth ideas- I need to try the protein. I am currently taking hair vitamins for healthy hair, and I see a lot of new growth (the brand is called Nourage, by the way). But your process also looks great, I am going to try it as well- thank you for the info!